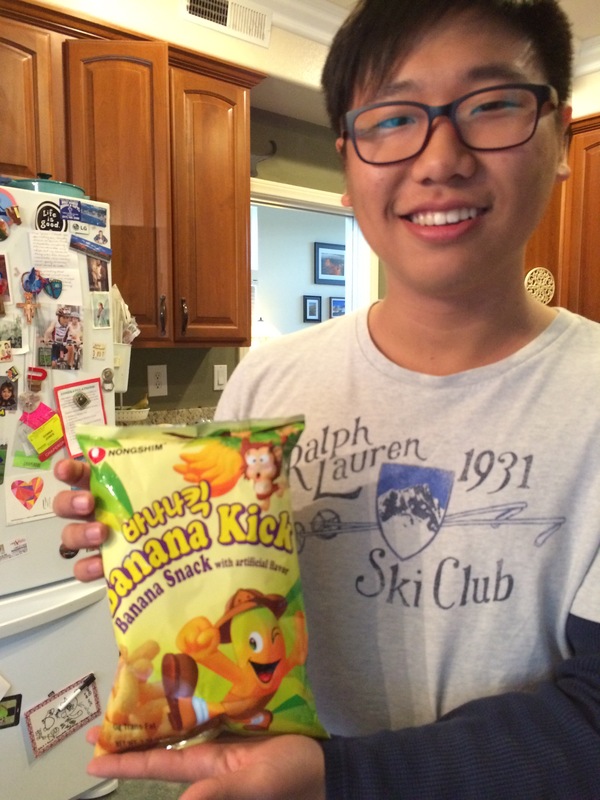 Banana Kick- Can you imagine your basic cheese puffs, with NO cheese or powder, but with banana flavor instead? Comments included “Holy crap, it’s a banana cheese puff!” and “ Weird, but cool; tastes less banana-y than they smell.” We dug these things. 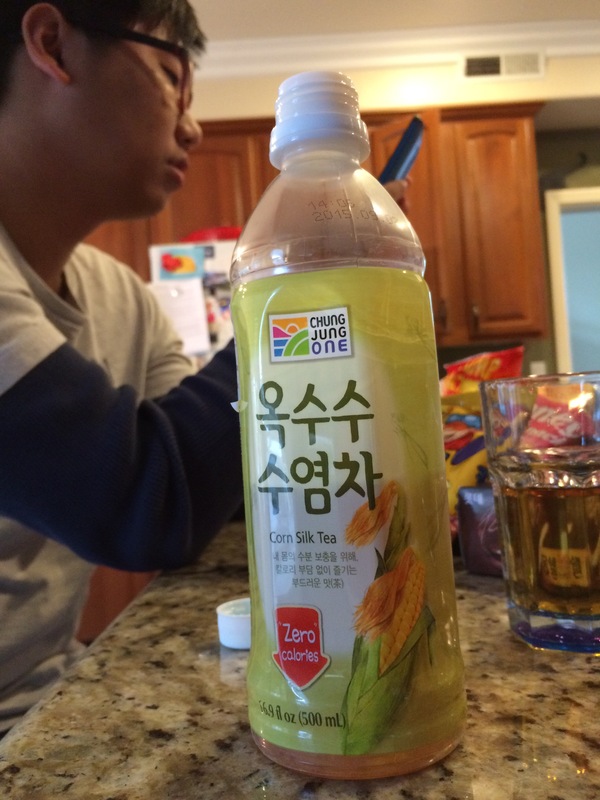 Corn Silk Tea- Joseph was so happy that we didn’t like this as much as he did. This was clearly one of his favorite home foods. Corn Silk Tea is a very mild tea that, very oddly, I thought tasted like tea plus the milk left over from a bowl of Cap’n Crunch. Yeah, I know, like I said- odd… but not in a bad way. I can totally see why this would be a favorite if you grew up drinking it- kind of like how most other world cultures can’t stand our root beer, but we Americans LOVE it. 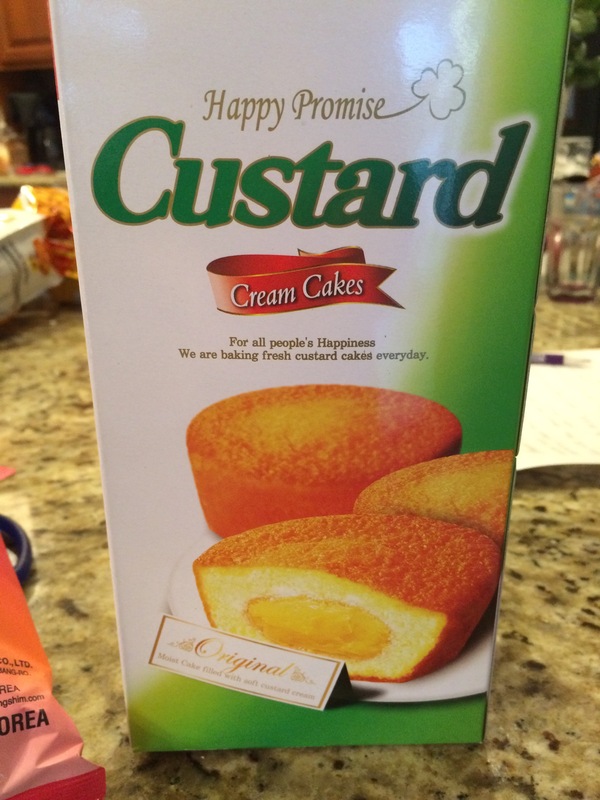 Custard Cream Cakes- Joseph and The Boyfriend said that these are Korean Twinkies. Honestly, the comparison is a bit insulting. These are WAY better than Twinkies. 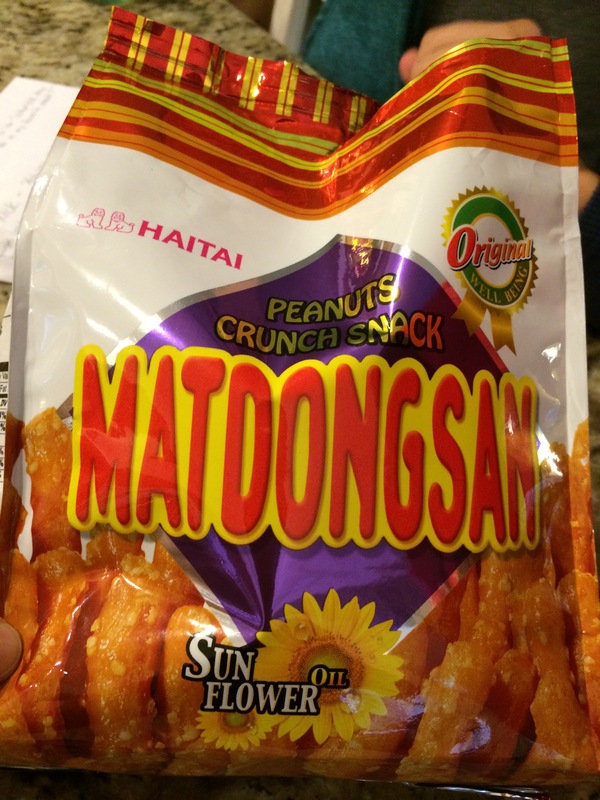 Matdongsan- One of the snacks that the boys were most excited to eat and have us try. To quote them: “Tastes like Korea.” I thought these were really good, peanut butter cookie meets cracker-y wafer-ish treat stick. 2% by Lotte (Peach Flavored)– Oh, man! This was great! 2% is a non-carbonated soft drink that is not overwhelmingly sweet. We all liked it. “Ooo, right in the Childhood,” was The Boyfriend’s comment. We totally should have gotten more of this in different flavors. 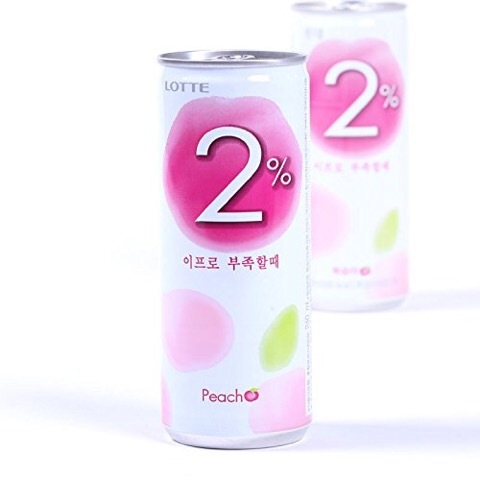 Get this- you can buy Lotte’s 2% Peach from Amazon, if you are so inclined. 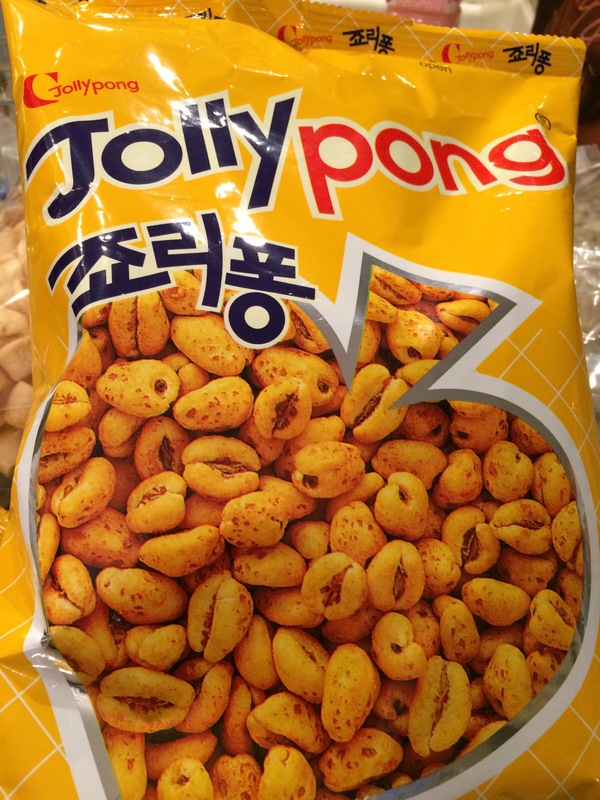 Jolly Pong- almost exactly the same thing as the American honey puffed wheat cereal Sugar Crisps (now called Golden Crisp to not sound so sugar laden) or Honey Smacks (does that cereal even exist any more) . But more delicate. Really good! We still have the frozen treat to try, and another aloe flavored soft drink, some various ramen and a couple more sweet snacks to try… Looks like Joseph will have to ask for an extension on his student Visa? We can hope. Have a great summer with your family, Joseph, and we wish you all the luck in the world when you start university next fall. New York doesn’t know how lucky it is to be getting you, I hope you take Manhattan by storm! We should make Willy do this with Chinese snacks next year, shouldn’t we- maybe between the Fall play’s Saturday performances? Ha, look out, Willy, you are next!